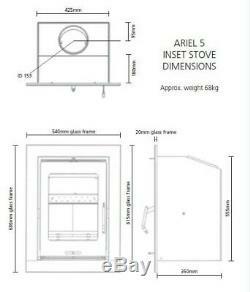 FDC Ariel 5G Multifuel Cassette Stove Re Furbished Defra Approved 5 Kw Inset. Designed and developed in the UK, FDC stoves incorporate a draught controlled tertiary airwash system which ensures a clean burn and reduced carbon monoxide emissions; resulting in consistently cleaner glass and a greener environment. A growing number of FDC wood burning stoves have achieved DEFRA exemption for smokeless zones, something of a formality when clean burning is designed and developed into the products from inception. These Clean burning stoves provide excellent heat output and efficiency by utilising advanced firebox and combustion technology. All FDC stoves are designed and manufactured to comply with CE Standard EN13240 & EN13229. Clean burn tertiary airwash system. External rotary grate riddling system. Efficiency - 80.0% wood. Efficiency - 83.4% smokeless fuel. CE approved for wood and smokeless fuel (Ancit). Exempt under section 21 of the Clean Air Act 1993 for use within smoke control areas (Air limiter bracket must be fitted). 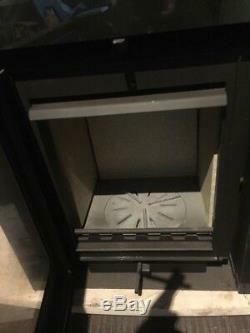 Simple flue connection via the internally removable top outlet spigot. 5 liner compatible (additional adaptor required). Optional cast iron multifuel kit available - protects liners and reduces internal volume when burning smokeless fuel. Three and four sided frame option. Accepts up to 11 logs. The item "FDC Ariel 5G Multifuel Cassette Stove Re Furbished Defra Approved 5 Kw Inset" is in sale since Friday, January 4, 2019. 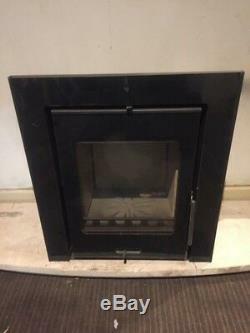 This item is in the category "Home, Furniture & DIY\Fireplaces & Accessories\Other Fireplace Accessories". 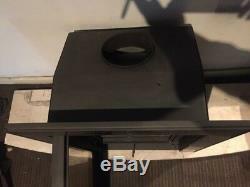 The seller is "qualitystoveparts" and is located in Malvern. This item can be shipped to United Kingdom, Austria, Belgium, Bulgaria, Croatia, Cyprus, Czech republic, Denmark, Estonia, Finland, France, Germany, Greece, Hungary, Ireland, Italy, Latvia, Lithuania, Luxembourg, Malta, Netherlands, Poland, Portugal, Romania, Slovakia, Slovenia, Spain, Sweden, Australia, United States, Canada, Japan, New Zealand, China, Israel, Hong Kong, Norway, Indonesia, Malaysia, Mexico, Singapore, South Korea, Switzerland, Taiwan, Thailand, Bangladesh, Bermuda, Bolivia, Barbados, Brunei darussalam, Cayman islands, Egypt, Guernsey, Gibraltar, Guadeloupe, French guiana, Iceland, Jersey, Jordan, Cambodia, Liechtenstein, Sri lanka, Macao, Monaco, Maldives, Martinique, Nicaragua, Oman, Pakistan, Paraguay, Reunion, Chile.